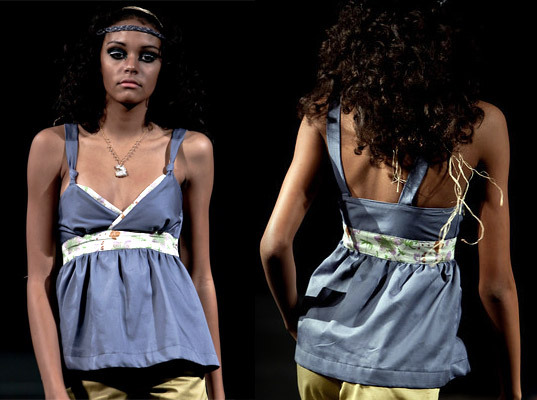 Presenting my Spring 2010 collection at Vert Couture, Chicago Fashion Focus’s first-ever, all-sustainable runway show, on Sunday was an amazing experience—and a hectic one. 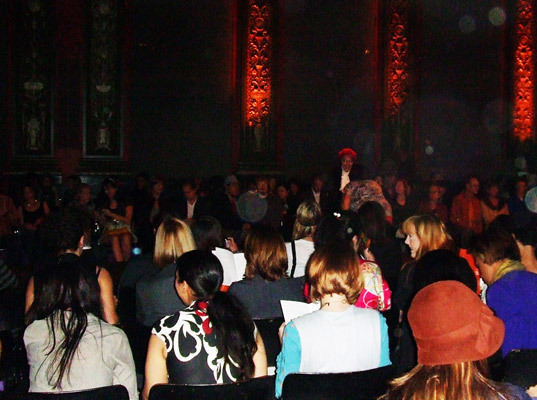 Many people from Chicago’s fashion and green scenes came together to produce the show, and the backstage buzzed with excitement, chaos, and anticipation as the designers, producers, models, makeup artists, and crew prepared for the event. I took the opportunity in between last-minute fittings, run-throughs, and the show itself to capture some behind-the-scenes moments at this groundbreaking inaugural event. 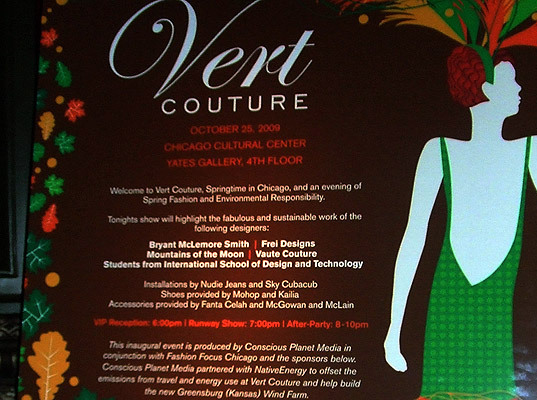 The official Vert Couture sign, printed with and on eco-friendly materials, was set up in the lobby to greet guests. Dubbed “An Evening of Chicago Spring Fashion and Environmental Responsibility,” the show featured local eco-designers, including Vaute Couture, Frei Designs, Bryant McLemore Smith, and of course, Mountains of the Moon. Aveda and Sugar & Spice provided hair and makeup for our beautiful Ford Models pre-show. That afternoon, a final run-through to nail down timing before the big event. The volunteer dressers arrive and I take a few moments to go through each of my looks with them. Models from Ford prepared to dress for the show’s first looks. The DJ began to spin tunes for the crowd in advance of the opening looks. 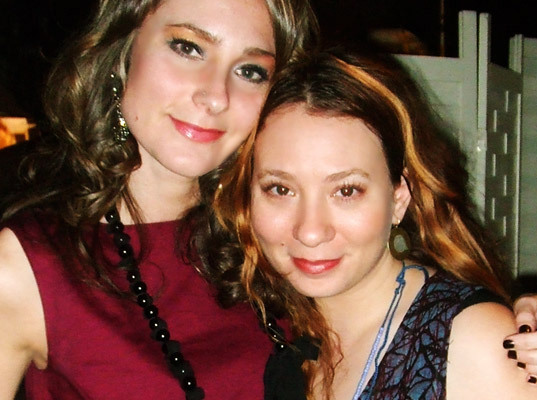 Annie Novotny of Frei Designs and I waited in anticipation to show our collections. After a quick change-over into my looks, my models waited to walk. I quickly made some finishing touches on each model before she hit the stage. The Spring 2010 collection of Mountains of the Moon made its entrance. After my collection showed, it was time for the designers and models to take a final group walk. Many thanks to my amazing assistant Mary Welch Fox (a New York Fashion Week dresser alum), who took a break from Mountains of the Moon to work non-stop for two weeks to help Vert Couture founders Bianca and Michael Alexander create an incredible show. I am really glad to see that green fashion is making its way to famous fashion shows. This way more people will learn about it and understand that eco-friendly clothes can be pretty and fashionable. I only recently learned that myself. These days everybody seems to be trying to do something good for the environment and my family is no exception. So I shouldn�t have been surprised when my wife started talking about green fashion. While I care about the environment as much as the next guy, that seemed a bit extreme. In my mind, words green fashion conjured up images of potato sack like clothes made of hemp or some such material. But my wife is very persistent and she loves surfing the web. So she found a great website www.luxgreenliving.com, that sells really beautiful, fashionable, modern looking clothing made from organic cotton at very reasonable prices. Hopefully, if green clothes become bigger part of fashion world, more people will realize that it is good for the environment and that you don't need to look like a potato sack to care about the world you live in.